Nail Polish Talk is a once-a-month feature where I talk about the nail polish I wore and bought that month. So, for July, I wore Linden, Jacqueline, Joyce and Princess Grace. It didn’t occur to me to wear something for the 4th of July until after the 4th of July, otherwise I would have done something patriotic. 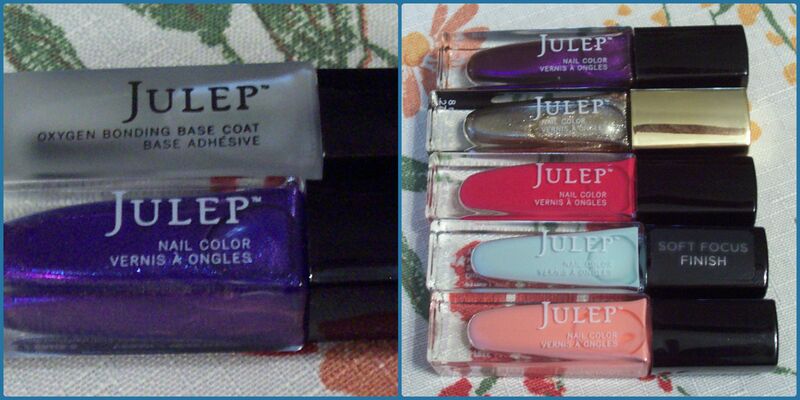 I wore Linden by Julep, which I really liked! It reminded me of a pool of water (really, any body of water), and it was darker and more grey than I expected. It looked a little bit lighter in the bottle and slightly different on the website (which I never fully trust, because it could just be my computer screen). And it did go on a little thick, but it did even itself out after a couple of coats. I really like Jacqueline! It definitely lives up to the description of bright grenadine shimmer, and it’s really pretty and bright, and I just want to look at it all the time because it’s so pretty. Never have I wanted to repeat a color more than this one! It’s a good summer color, but it would also add a nice splash of color during the fall or winter (especially if you live in a place that actually has seasons). Joyce is such a good Christmas red! And a few days in, I remember I was going to wait until around Christmas time to wear it, but it’s too late for that now. (I do have a few other reds that will work for Christmas, so it’s not too bad). But it is a pretty red, and for whatever reason, I was in the mood for this shade of red. This is one of my favorite colors- I kind of forgot how pretty and spring/summer-y it was until I wore it. It did go on a little thick and goopy (more than I remembered) and the first coat was a little streaky, but that evened itself out with a 2nd coat. I opted for the mystery box (which caught my eye after not liking any of the nail polish/beauty products offered, and kept me from skipping this month). I also got a couple of add-ons, which I don’t normally do, but I had some Jules (their rewards points system) saved up, so I used it for that. First, the mystery box. This is the 2nd mystery box I got from them, and I was pleasantly surprised! I was nervous going in, because I had no idea what colors I was getting. So I wasn’t sure if I’d get any duplicates (just one) or if I’d get colors I liked. Hazel, which I wore a few weeks ago, and liked, so it’s good to get a color I know I love. The fact that I never finish a bottle of nail polish is a completely different story. Sienna, which I really like! I’m looking forward to wearing it a lot. Drew, which I like (and can see myself wearing) but I don’t know that it’s a color I’d pick on my own. Ali, which is a really soft mint. This is a color I’d probably pass on, if given the choice. I’m really pale (the sun is not my friend, but sunscreen is) and while Ali will probably be fine, I have the feeling it will look a lot better on someone who has the ability to tan. I’ll definitely give it a try though. Alicia. It’s a salmon color, and like Ali, it’s probably a color I’d pass on if I had the option of picking. And like Ali, I’ll give it a try. Who knows, maybe I’ll really like it! Danica, which looks much more violet in real life, and has a lot more shimmer. Like Sienna, I can’t wait to wear it. Oxygen Bonding Base Coat. I feel like I’m always trying out new base coats, but I was intrigued by this one, since it’s supposed to help your manicure last longer. That’s always good. And my nails have a tendency to crack and peel (no matter how hard I try to not wear nail polish for a week, it never seems to work), so hopefully this will help make them a little bit healthier! I did get a chance to wear it (starting with Jacqueline) and it help better than expected. My index fingers had their normal amount of chipping (on one side and after a couple of days) but the rest of my nails didn’t start chipping until the end of the week. And even then, it was the tips and not super-noticeable. All in all, I’m pretty happy with it so far! I skipped the August box because while I liked a couple of the colors, I don’t know that I liked them enough to get the box.